Unlike elsewhere in the world, the solid bullet plays an important role in African hunting. Members of the Big Bore Association Southern Africa, home to those African hunters that pursue the big, the bad and the ugly, spend as much time on testing and evaluating solids, as plains game hunters spend on evaluating softs. Modern solids are better than ever before in history and one can probably sit back and say: ‘Well, that is good enough for me.’ That may be so, but unfortunately the African game you hunt with solids just hate not being killed cleanly the first time round. They often exhibit very unsocial traits, an appalling sense of humour and extreme vindictiveness once you have made a hash of killing them cleanly. When it then suddenly becomes your skin on the line, instead of theirs, you tend to adopt considerably less complacent expectations from what you are going to throw at these creatures. What constitutes failure in a solid? Failure to kill due to jacket and core separation, or breaking up, comes to mind. Deformation as well. Deformation normally constitutes base flattening, bending, or a combination of these two. The breaking up of solids have largely been solved through bonded core technology for jacketed lead core solids, and the introduction of homogenous (monometallic) brass or copper solids such as the Barnes, Thunderbird and GSCustom designs. That still leaves deformation; comprising of flattening of a large portion of the tail end of the bullet on the one hand, and bending on the other. The general statement normally is that the bullet struck (nicked) a bone, deformed and subsequently tumbled, causing it to veer off course. This is an acceptable explanation when the bullet has bent. Virtually without exception the base is not flattened or deformed, while the nose shows the point of impact through grazing or deformation. When it comes to base flattening the ‘nick-theory’, as described above, just does not make sense. Why? Because a bullet that has nicked a bone generally exhibits confirmatory markings on the ogive, and mostly also nose deformation. In the case of base flattening it is extremely rare to find any signs on the bullet nose indicating a high-speed crash with an animal's foundations. 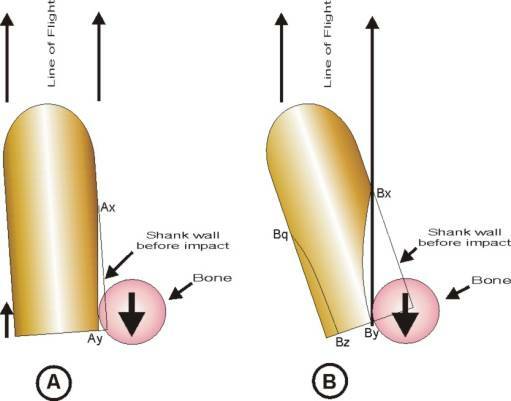 The nick theory explains base deformation by holding that the bullet base gyrates or yaws around the line of flight and penetration – exposing the rear end of the shank to the terminal media. Such an exposed part of the shank then nicks a bone. The impact deforms it by flattening the base area – causing it to tumble and lose direction. Let us take a look at the logic behind this by first looking at a couple of photos of typical base damaged solids. What immediately becomes obvious is the extent of the base deformation, measured both in bullet length and width. Now just imagine how skew the bullet must have been at the moment of impact with the bone, in terms of this theory, to suffer this kind of damage almost from the middle of the shank. Ask yourself whether the bullet would have reached the animal if its base had yawed so much during flight that it exposed that much of the shank during travel. I am simplifying somewhat because a bullet stabilized for atmospheric travel is less stable in denser animal tissue and yaws a bit more terminally than in air, but definitely not the half caliber and more of deformation required for the nick theory to be valid. In Sketch 1 we have two scenarios, Scenario A, where the bullet base yaws at an angle of 4° around the line of flight, and Scenario B, where the bullet base is about 20° off the line of flight. The base deformation we come across generally looks similar to Scenario B – if not more pronounced. If the nick theory offered the correct explanation and if the yaw was minute enough for the bullet to be reasonably accurate and reach the target where aimed, then surely the deformation should be similar to Scenario A with more or less straight line deformation between Ax an Ay. What we find in practice is that the base deformation looks much more like in Scenario B, with the deformation not linear, but curved as represented by line Bx to By. If you think about it, the nick theory does not explain why the line curves to the left (in our sketch) of the direction of the allegedly applied force. Another phenomenon not explained by the nick theory is why we more often than not find the base also deformed along the Bq – Bz line, if the force was linear and applied in a straight line and only between Bx and By as explained by the nick-theory. For the base to also collapse along Bq to Bz, it means that some kind of force transverse (direction Bq – Bx and Bz – By)to the line of flight must have been experienced. Think of a blob of dough falling to the floor. On the side that touches the floor, let’s call it line Bx – By, the dough flattens. Not only that though, it also flattens on the top (call it line Bq – Bz) where it had not touched anything. This phenomenon is not explained by the nick theory. All sketches were made to convey the concept with image assistance, not for the sketches to be a perfect rendition of reality. You can go even further and fire solids from a big game rifle and check if the holes in the paper target exhibit the Sketch 1 Scenario B kind of yaw required for the nick explanation to hold water. In terms of the nick theory, the bullet nose would already have passed the source of deflection (bone) before deformation commences. Apart from the bullet being gyroscopically disinclined to veer off course at right angles, the deflecting force is imparted to the rear end of the bullet in terms of this theory. Despite the impact on the base, the larger and heavier front section of the bullet will gyroscopically still tend to pull the base back into line after the impact, softening deviation at right angles to lower angles of deflection. The point I am trying to make is not that it can never happen the way it is explained in terms of the nick-theory, but that it would be the exception rather than the rule. What actually happens most of the time is that a bullet is stabilized for atmospheric travel with a specific rate of twist in the barrel. Let us assume a 500 - grain .458 caliber jacketed solid measuring 1.388” in length. In terms of the Greenhill formula it requires a twist of 1: 23.5” to be stable in flight. It is not really important for purposes hereof, but the Greenhill formula normally provides a stability factor in excess of the theoretical 100%. This is to ensure that the bullet would be stable across a wide velocity spectrum, even if the atmospheric conditions are not ideal. If we assume for convenience of calculation only that animal tissue roughly equals water’s specific gravity, then the rate of spin of the bullet should be tightened to 23.5 divided by 30 for a spin of one revolution in 0.783”! The rate of spin of the solid bullet in our example cannot be changed upon impact and will remain roughly at the air stable 1,149 rps instead of the 34,468 rps required to be similarly stable in water/animal tissue. The instability dramatically increases the bullet’s tendency to tumble. Once the bullet tumbles it exposes its shank and base to the kind of impact deformation on bone and sudden change of direction commensurate with the structural damage normally exhibited by base deformed solids. In other words, – the bullet becomes unstable, tumbles (not merely yaws more) and if it then impacts on bone or something, it deforms and could veer of course at an acute angle. Because the direction of the forces can point anywhere, rather than basically linear with the line of flight, as claimed by the nick-theory, this ‘tumble-theory’ explains the nature and extent of the base deformation eminently better than the nick theory. The tumble theory also better explains the degree and severity of bullet deviation from its original line of flight than the nick-theory. Sketch Two Scenario C shows the bullet in flight as it enters the terminal medium and becomes unstable. 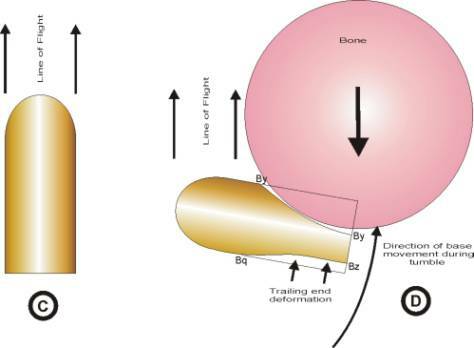 Scenario D show the bullet tumbling and impacting on a bone or obstruction. How can a solid be designed to counter the unavoidable terminal instability and tendency to tumble? The first solution lies outside of the bullet design. Gyroscopic stability of the bullet must be increased by using a much tighter rate of twist for dangerous game rifle barrels, given bullet length, than is the norm. Secondly – opt for the shortest possible solid of sufficiently good quality and design. A 500-grain brass wadcutter of .458 calibre is shorter than a round nose of the same weight, material and calibre and that in turn is shorter than such a spitzer. The late Elmer Keith introduced us to the improved wound channel and energy transmission properties of the wadcutter. This is confirmed by Duncan MacPherson in his work Bullet Penetration – Modelling the Dynamics and Incapacitation Resulting from Wound Trauma, based on the research of the world’s leading wound ballistics expert, Dr Martin Fackler. By opting for this shape one would incorporate as much punch into your solid as possible. Although reasonably compatible with single shot and double rifles, the wadcutter is not at all compatible with smooth and flawless feeding in bolt action rifles. One step down takes us to the semi-wadcutter that can very effectively be combined with bolt action rifles. The semi-wadcutter with its large flat nose also has other advantageous properties apart from relative compactness and effective transferring of energy. These additional properties we will now move to, may or may not, contribute to increased effectivity in a given situation, but the existence of these properties at least have no detrimental terminal effect. In terms of the explanation presented above, the inevitable conclusion is that a solid should always tumble due to it becoming unstable in terminal media such as animal tissue – yet they quite often do not. How can that be explained? 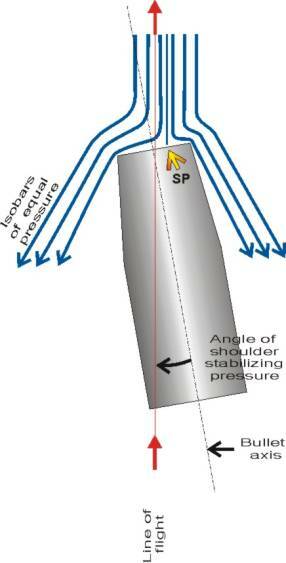 First is the issue of shoulder stabilization, and secondly there is supercavitation. Shoulder stabilization occurs when a free stream of moving matter such as water or flesh hits a plane such as a bullet’s nose, the stream is only stopped at one single point in the middle of the plane (bullet nose). The point where this occurs is called the stagnation point (SP). All other stream particles deviate to the side of the plane. Logically the force from the stream develops pressure on the face of the plane. Graphically this is best explained by the enclosed diagram (Sketch 3) published in the 1920’s by Ludwig Prandtl. The red lines denote a stream of fluid (meat – animal tissue) impacting on a plane (wadcutter bullet nose). The red stream lines denote equivalent speeds of tissue displacement, while the blue eliptical lines denote equivalent pressure (isobars) that develop on the wadcutter bullet face during the process of straight line penetration. In the center one finds SP – the stagnation point, at which point the fluid stream is stopped and where pressure is at it’s highest. Shoulder stabilization basically entails that, when an object such as a flat plane (wadcutter bullet face moving though air, or animal tissue) the medium through which the bullet moves is deflected equally in all directions. Pressure dissipates as distances increase from the stagnation point. The pressure naturally is highest at the center (stagnation) point and when a bullet moves in a straight line, the pressure, called jam pressure, is evenly distributed across the bullet nose but drops off towards the edges of the bullet face. When the traveling bullet lacks or loses directional stability and tilts in any direction, the stagnation point (of highest pressure) shifts off center in the same direction in which the base deviates from straight flight. The point of highest pressure thus shifts towards the leading front edge, while it drops off towards the trailing edge – resulting in uneven pressure distribution. Because the highest pressure is closest to the leading edge, it then retards the leading edge more than it retards the trailing edge, as the pressure / resistance (retarding force) on the trailing edge is less. This redistribution of pressure combats tumbling to some degree as it continuously attempts to re-align the bullet center along line of travel. This phenomenon is illustrated in Sketch 4. Just as shoulder stabilization contributes towards atmospheric stability during flight, it similarly contributes towards terminal stability during penetration. The rough extent to which shoulder stabilization counters a semi wadcutter bullet’s tendency to tumble can be calculated by a good physicist such as the German hunter, Lutz Möller, who has been doing some research in this regard. How much we do not know, but it can be modeled by a physicist with the variables at hand. One must of course accept that the contribution to stability that can be made by pressure on the relatively small face of a flat nosed bullet, can never compare to the forces involved in gyroscopic failure or the leverage that follows tumbling. At worst it possesses higher theoretical tumbling resistance potential than sharper tipped solids. The second explanation is forwarded by Dr Norbert Hansen, designer of the SuperPenetrator solid. Many of us have seen supercavitation taking place when watching the propeller of a boat spinning through water and bubbles form along the leading edges of the propeller blades. 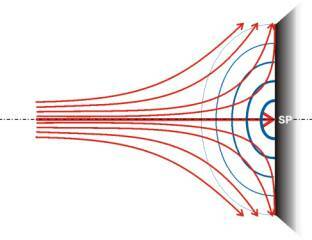 When a body moves through a fluid at high speed and the fluid has to move around it at a rapid pace, the pressure in the flow area drops in terms of Bernoulli’s law. In the case of a bullet traveling through a medium such as water (or animal tissue containing huge percentages of water), the water or tissue has to flow around the bullet. The faster the bullet travels through the water, the more the pressure in the flow decreases and a point can be reached where the flow pressure equals the vapour pressure of water (or any other medium it is traveling through). When that occurs, the water converts to gas and bubbles or cavities appear and that constitutes cavitation. The sharper the edge across which the flow occurs (such as a semi-wadcutter leading edge), the easier it happens. The more the cavitation due to faster flow (higher velocities) the more rapid the extent of cavitation, until a point is reached where all the small vapour bubbles fuse into a large, stable bubble around the bullet (Sketch 5). The single large bubble enveloping the bullet constitutes supercavitation. The effect of which is that only the meplat on the bullet nose remains in contact with the terminal medium. The rest of the bullet travels in a capsule of low-pressure tissue vapour, much more comparable to air than water or flesh. While encapsulated in this low pressure cavity, penetration reducing drag on the bullet as well as its tendency to tumble is reduced because it travels in a virtual atmospheric medium – not the 30-40 times denser water or body tissue. Unfortunately this supercavitation bubble is fragile and easily lost in the rough conditions prevailing when a bullet travels through an animal. When it is lost, tumbling follows. Hansen’s experimentation (on test media and elephants) is very promising. On wet media and body shots, traditional round nose solids provided an average of 31.5” of straight line penetration before tumbling, whereas the flat nose, supercavitating bullets achieved an average of 95.0” of stable penetration. This is similar to the reported 78" to 144" penetration reported on elephant with GS Custom FN solids where supercavitation also occurs. Supercavitation is therefore another reason for the current African philosophy that a solid should have a large flat nose (meplat). Not only for maximum shock transfer, but also for increased terminal stability potential in terms of the supercavitation and shoulder stabilization concepts. In dry media (bone and elephant skull) where supercavitation does not play an important role, these flat nose bullets penetrate less than round nose bullets. However, in all instances homogenous 500-grain .458” semi wadcutter solids launched at muzzle velocities exceeding 2,200 fps provided satisfactory penetration in frontal brain shots on elephant. Seeing that the design criteria derived from the above not only point to a semi-wadcutter shape with a sharp intersection between the meplat and ogive, but at homogenous construction, one can then just as well add a banded shank to the design to reduce barrel fouling and pressure. The two bullet designs currently coming closest to meeting the above criteria, are the GS Custom Flat Nose Solid (extensive range of weights and calibers) manufactured in Port Elizabeth, South Africa, and the limited range of SuperPenetrators manufactured by Michael Reichenberg Spezialgeschosse in Germany.